starring Patrick Stewart, Sir Ian McKellan, Hugh Jackman, Jennifer Lawrence, James McAvoy, Michael Fassbender, and more. I must say this movie was soooooooo much better than Amazing Spider-Man 2. I feel like Spider-Man is cursed. The first movie starts out really good and then it starts to go downhill from there, similar to the Tobey Maguire Spider-Man movies. And y'know what that is? It's the Parker luck. I've been a fan of all of the X-Men movies, so far. (Though I can't include the Wolverine Origins movie since I never got around to seeing that one. I probably should do that sometime.) Anywho, X-Men: Days of Future Past brings together characters from both X-Men and X-Men: First Class. Life in the future isn't peaches and cream for the X-Men team. In the 70s, after humans realize there are mutants living amongst them the government sees fit to create weapons to protect themselves and combat the mutants called the Sentinels. They are huge weapons of mass destruction that start out targeting mutants. Then they begin to target and execute humans, too, who may likely have mutant children or grandchildren. There are some humans who try to stop the Sentinels at that point, but it's too late. It's like an end of the world scenario and the only way for them all to survive is if the X-Men can travel back in time to stop the Sentinels from being created in the first place. The only mutant with the capabilities to withstand time travel is Wolverine since he has incredible healing factors. The biggest key to stopping the Sentinels is to stop Mystique from murdering the inventor of the Sentinels. He is an incredibly ugly soul who's experimented on and killed mutants for his own scientific curiosity/gain. When Mystique kills him, the government captures her and is able to take the Sentinel program so much further with the use of her DNA. Mystique has the unique ability to shape-shift and adapt. This is what makes the Sentinels of the future so hard to destroy. 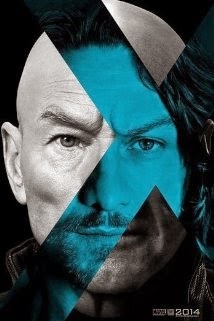 Charles Xavier and Magneto have to work together with Wolverine as the best bet to find and stop Mystique. It's not an easy feat considering Charles and Eric have completely different viewpoints on the Mutants vs. Humans issue and that they both feel abandoned by each other. Wolverine doesn't do a whole lot. His main objective is to not wake up too soon. His mind is in the past while his body sleeps in the future and as soon as his body wakes up, any changes in the past will take hold and change the future. I loved seeing new characters introduced like Blink and Quicksilver. One of my favorite scenes was the one where Quicksilver helps break Magneto out of the Pentagon. All of the make-up and special effects were cool. I did find Professor X's wheelchair a bit unusual. It didn't look like a wheelchair or even a futuristic wheelchair, more like a floating regular chair. This was a very good movie, though. And I especially liked all of the character moments with Charles and the moments with Mystique. I found them complex and well developed. It was cool seeing Apocalypse at the end of the credits, too. I walked away feeling good about this movie. I actually feel like I want to re-watch those earlier X-Men movies, especially X3 as I've seen that one the least amount of times over again. No major complaints. I'll give X-Men: Days of Future Past 4.5 out of 5 stars.